Originally unveiled as a fuss-free ladies' watch, the Elegante is now available in a larger size for men, while still keeping the quartz movement that goes to sleep to preserve battery life. 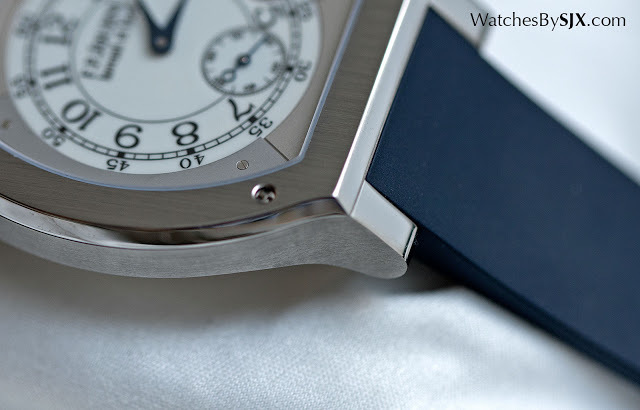 Here's a hands-on look at the watch, including original photos and the price. F.P. 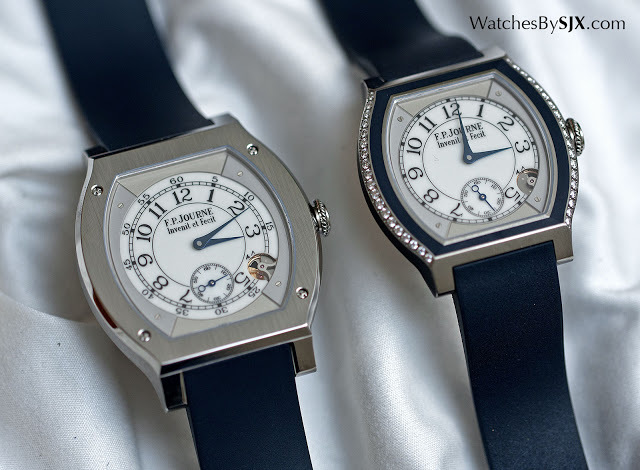 Journe introduced the Elegante in 2014, a watch conceived as a sporty-ish ladies’ watch with a smart quartz movement that goes into hibernation after 30 minutes of being at rest. The Elegante sold well enough that a men’s version was just introduced this year, equipped with the same quartz movement, except in a larger case that’s 40 mm wide and 48 mm long. It looks large but being a slim watch, it is 7.35 mm high, and made of lightweight titanium, the Elegante is pleasingly comfortable on the wrist. 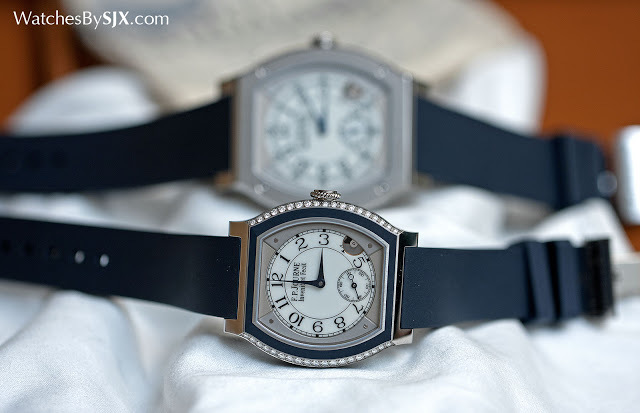 The look is identical to the ladies’ version, with a tonneau-shaped case featuring angled corners. 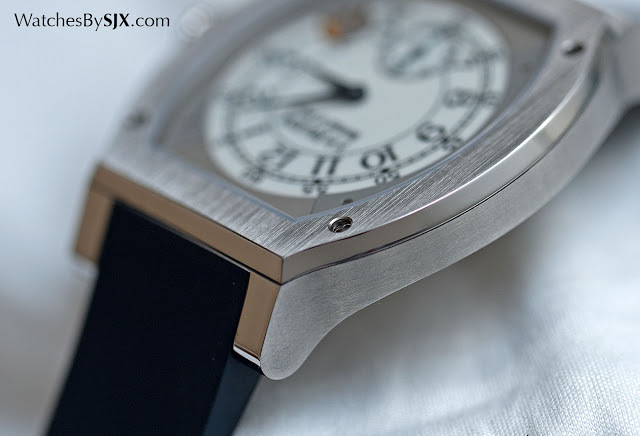 Despite being an entry-level watch, the Elegante 48 mm has a admirably detailed case finish. It has exposed screws on the bezel (the ladies’ model has rubber bezel insert), a detail that makes it look more expensive. 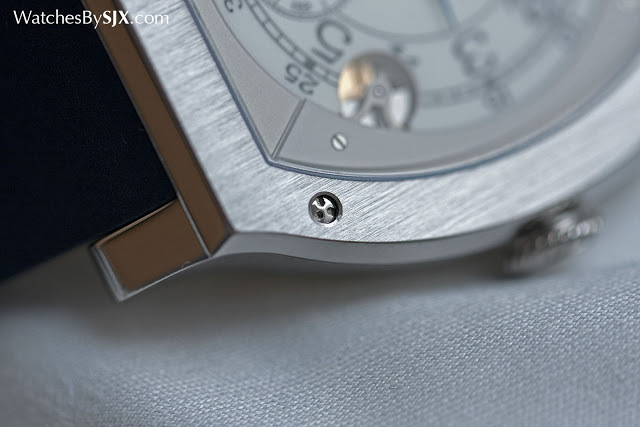 And the Elegante case also features alternating brushed and polished surfaces, something missing from traditional F.P. 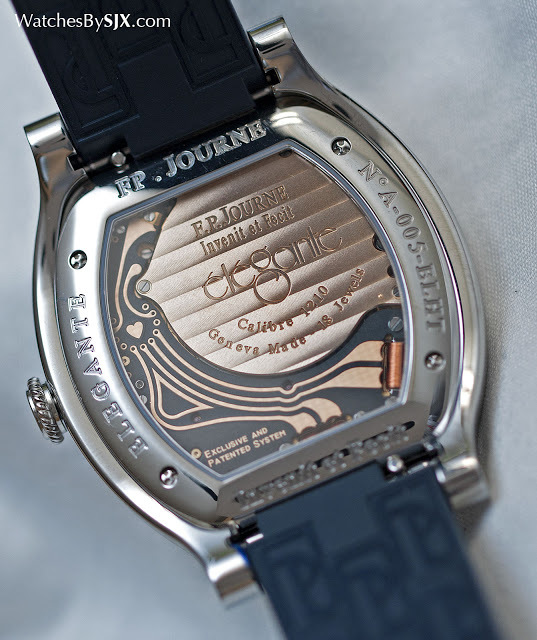 Journe that have entirely polished cases. The entire dial is luminous and entirely covered in Super-Luminova, a feature first used on the ladies’ watch. The colour is meant to evoke mother of pearl, though it is recognisably Super-Luminova. 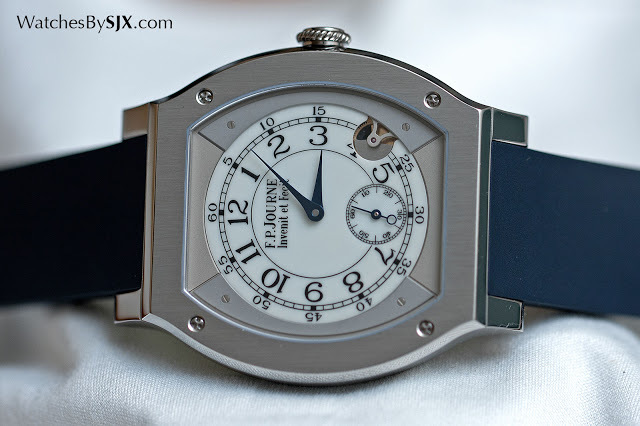 It does, however, look good, with the round dial properly proportioned relative to the tonneau-shaped bezel. Visible at four o’clock is a tiny weight that is the motion detector that’s essentially a tiny oscillating weight. 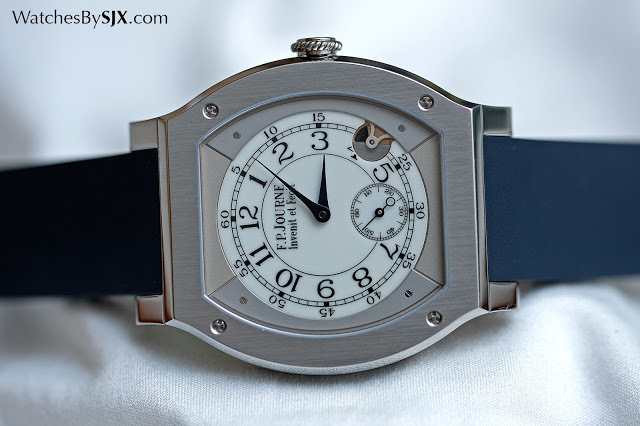 The calibre 1210 is a quartz movement developed by F.P. Journe that goes into standby mode, meaning the hands freeze but the microprocessor inside continues to keep time, once it is still for 30 minutes. In standby mode the battery is supposed to last 18 years. Once the watch is put on the wrist, the movement wakes up, bringing the hands to the correct time. With daily use the battery should last eight to ten years. Having a standby function to extend battery life is not new, Seiko introduced such a function with the Kinetic Auto Relay in 1998. Intriguingly, F.P. 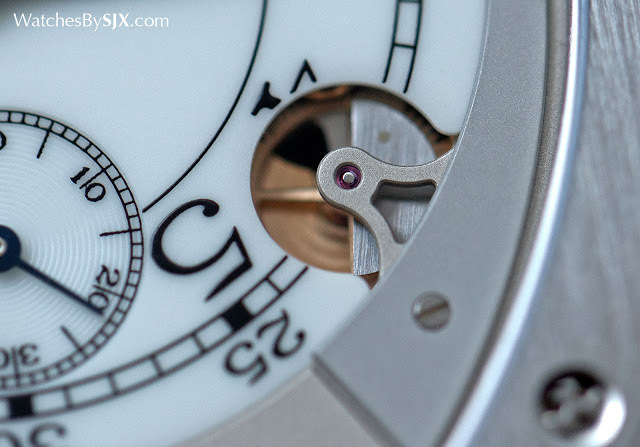 Journe has also made bridges and plates of the quartz movement in red gold, as it does for its mechanical timepieces. Conceived to be more attractive than most quartz movements, the movement is visible through the display back, and it succeeds at looking good. Being a quartz watch, the Elegante 48 mm lacks the technical credentials of its mechanical counterparts, even if it is smart and well made. That is especially so given that F.P. 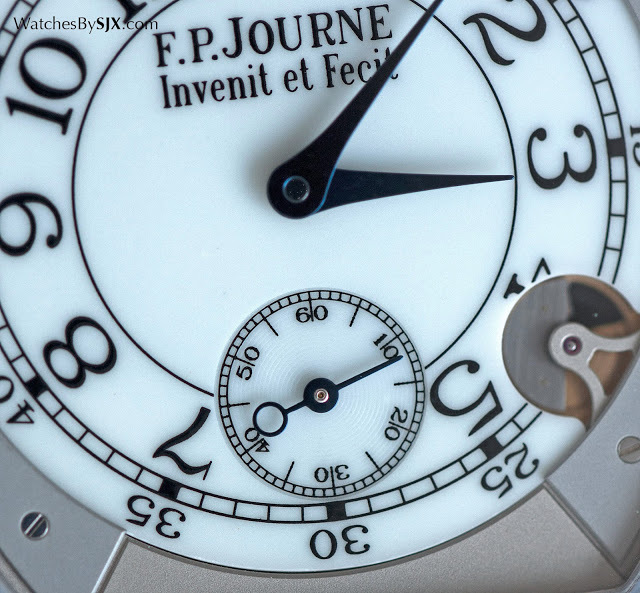 Journe is a watchmaker renowned for its ingenious complications. So it is hard to avoid the feeling that the Elegante is a fancy toy. Nonetheless as such things go, the Elegante is not especially expensive. 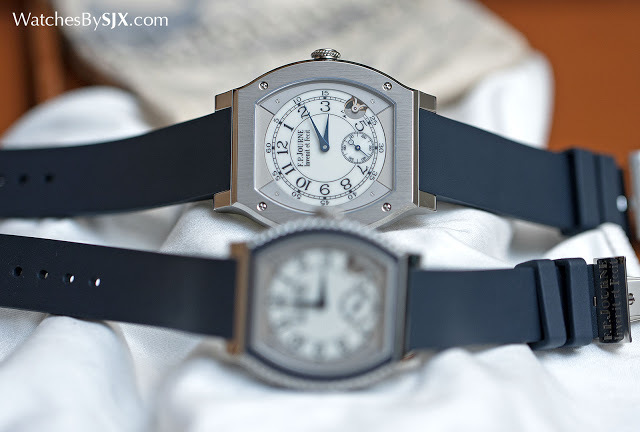 All things considered, it is an appealing proposition for a convenient, durable watch. Available only in titanium with a rubber strap, the Elegante 48 mm retails for SFr11,500 including eight percent Swiss value-added tax. That’s equivalent to US$11,700.